South Korea's LG Chem on Wednesday completed what it described as the world's largest battery plant for electric cars and vowed to become a major producer by 2015. The company said its factory in Ochang, south of Seoul, is the world's largest lithium-ion battery plant, with the capacity to produce batteries for around 100,000 electric cars each year. LG Chem, part of the LG group, said it would spend two trillion won ($1.84 billion) on building one new battery plant in South Korea and another in the United States over the next two years. The plants, when completed in 2013, will help LG Chem produce batteries for 350,000 vehicles annually. 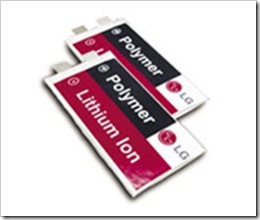 LG Chem aims to increase its share of the global electric-car battery market to more than 25 percent by 2015. The company has secured deals to provide batteries for General Motors electric vehicles, including the Chevrolet Volt, as well as Hyundai and eight other automakers. President Lee Myung-Bak said at a ceremony in Ochang that South Korea's future depended on its performance in environment-friendly technologies. Lee said green growth was an "unavoidable choice" in the times of climate change. The battery plant is a key plank of Lee's drive to develop renewable and substitute energy sources as new growth engines for South Korea's economy, the president's office said. It predicts the global market for electric car batteries is expected to grow rapidly to 16 trillion won in 2015 from the current 1.5 trillion won amid soaring oil prices and tougher environmental rules on emissions.